Chile, beans, corn, squash … you already know the ingredients that make Santa Fe’s world-renowned cuisine so deliciously compelling. Mix in 300-plus days of sunshine a year and you’d think that would be recipe enough for rising bright-eyed and bushy-tailed every morning, but we’re just like the rest of the world: there are times when a jump-start is a necessity. Ohori’s Coffee – This little roasting giant with the big, bold flavor was founded in 1984 by namesake and former owner Susan Ohori. From the Arabian Peninsula to the Americas, the coffee selection at Ohori’s is a global gathering. The fragrance in this shop alone can wake you up! Regardless of your coffee craving, rest assured, Ohori’s has a locally roasted brew that’s right for you. 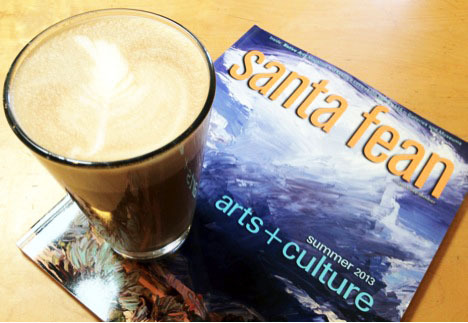 The Downtown Subscription – There’s a good chance you’ll land in Santa Fe with a dual need for fresh coffee and new vacation reading material. This dilemma is easily rectified if you satisfy your coffee jones indulging in an artfully-made latte from the sweet barista at The Downtown Subscription, while you catch up on Santa Fe and world news. Since a whole corner of the DTS (as the locals call it) is devoted to every magazine you can think of, as well as a broad selection of national and international newspapers, you can drink, think, and wake up to the world all in one sweet spot. Museum Hill Café – The charming Museum Hill Café is nestled to offer respite, and there’s nothing like an Illy Caffe to revive an avid museum-goer who has to switch gears from learning about Spanish Colonial Arts to admiring Japanese kites or comparing Native American pottery designs. This Café bills itself as “the best seat in Santa Fe you haven’t discovered,” and if that’s not an enticement, what is? The Teahouse – Walking all the way up Canyon Road after that long-ago morning coffee means your feet are tired and your palate is ready for something different. Relax … The Teahouse beckons! Slowing down with a cup of tea in the serenity of this quiet courtyard on historic Canyon Road imparts the sense of authenticity that special destinations like Santa Fe possess. Given its well-earned reputation as a unique destination, be assured Santa Feans know where to find the buzz, and a Coffee Lovers’ Tour can take you there. Dip into the taste of other cultures simply by stopping for coffee or tea at a local spot where the staff is as committed to their beverages as the City Different is to its diverse community. Choose adventurously — and drink deeply — to enjoy the flavors of Santa Fe.